Steel Up and Over Wood Effect Garage Doors finished in Golden Oak or Rosewood Foil Laminate by Hormann, Garador, Fort and Cardale at discounted prices. 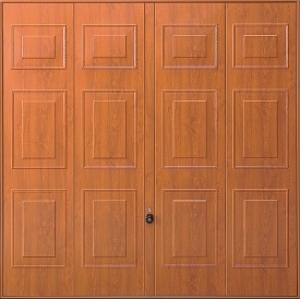 Doors have the appearance of real timber. They are low maintence and come with a 10 year manufacturers guarantee. Can be fitted on steel or timber goalpost frame. Thick gauge of steel. An ideal low cost alternative to GRP garage doors. Strong, secure and available in numerous designs and sizes. 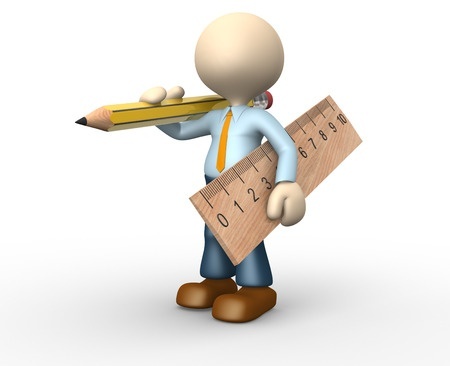 Some designs available made-to-measure. Come complete with CE marked anti-drop counterbalance mechanism. All mechanism and locking come pre-installed and pre-tensioned for quick and easy installation to timber garage door frame. Pre-installed steel garage door frames available, if required. 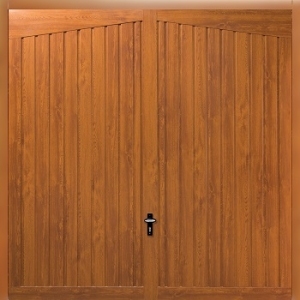 The popular Golden Oak and Rosewood finishes for these garage doors are a perfect match to upvc doors and windows etc. Wash / wipe clean surface. Wood effect steel up and over garage doors. 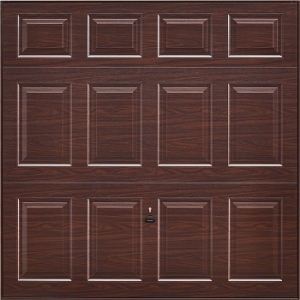 Wood effect steel garage doors have become very popular due to their attractive appearance and are a perfect match to the very popular Rosewood and Golden Oak UPVC doors and windows. 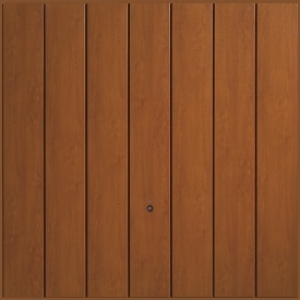 These doors are very low cost compared to real timber garage doors and GRP garage doors. 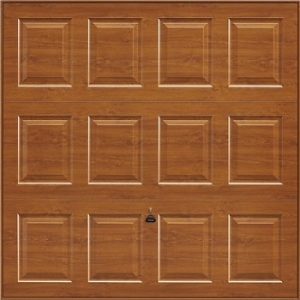 The advanced material technology used makes these doors beautiful and low cost. 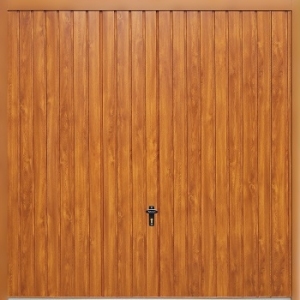 Up until approximately 2005 all wood effect maintenance free garage doors were made from GRP (glass reinforced plastic). All leading manufacturers such as Hormann and Cardale managed to integrate the newly developed foil technology into their steel garage door range and a reliable supply was created. The foil coating is only a few microns thick, chemically bonded onto the surface of the steel door panel, but is UV-fast (10 year manufacturer guarantee) and very durable to everyday knocks and scuffs. Weather resistant, just a wipe down or a wash down removes any dirt or splash, returning the door to its showroom condition. 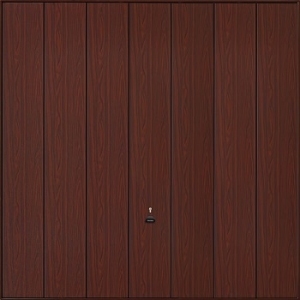 The grain effect is very realistic with the rosewood colour having the black flashes of grain characteristic to Rosewood UPVC. Another benefit of the Golden Oak and Rosewood finishes are that UPVC trim and cladding is readily available for trimming round the door and frame. Matching fascias and soffits can cheaply and readily be made at low cost, and trim for top and sides to attractively cover small gaps round the edges of standard size doors. 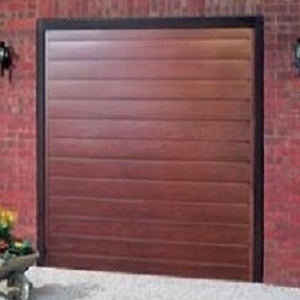 This enhances the appeal of these very competitively priced garage doors. We supply numerous trade UPVC door and window companies with these products as well as insulated electric roller doors and sectional garage doors that are also available in wood effect foil laminate. 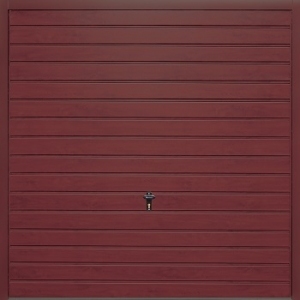 The garage door itself has the same construction, mechanism and locking as the steel powder coated door. It is available in numerous standard sizes, and made to measure if required, with factory fitted Canopy and Retractable counterbalance mechanism. The Retractable option should be chosen if you intend to automate the garage door, now or in the future, with an automation kit. Unless fitting the door to an existing sound timber goalpost frame most customers purchase the door pre-installed to a steel goalpost fixing frame. 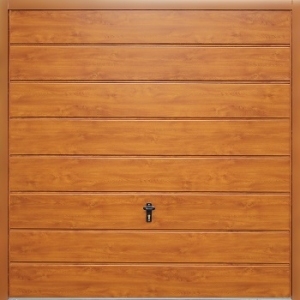 On the popular Hormann and Garador range of Decograin foil finish doors the Golden Oak doors come with a very near match painted frame in RAL. 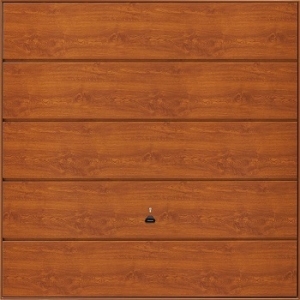 The steel frames on the Rosewood version come in a close match RAL colour. Although these frames are not foil laminated the frame colour is a very good match to the door. 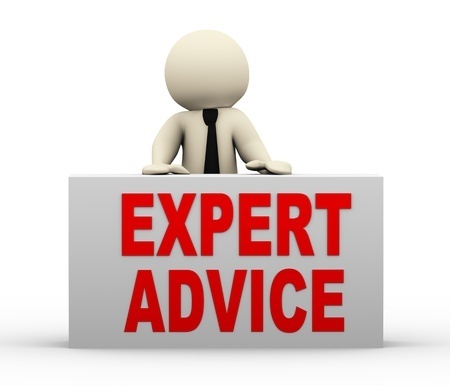 At low cost, some customers choose to clad the front of the frame with matching UPVC trim to ensure a perfect match between door and frame. 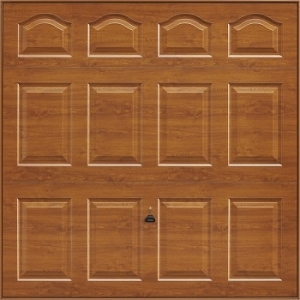 Simply click on the chosen model of door above to view all sizes, prices, options etc. 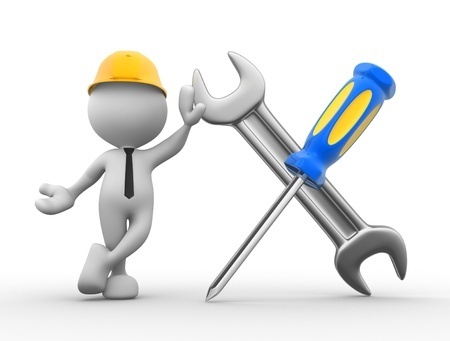 If you require installation as well you can view our garage door installation team in your area by clicking the link. 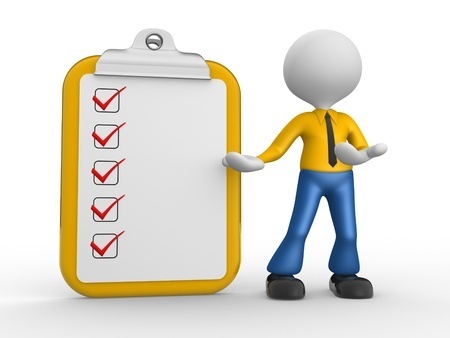 As ever, any questions simply phone our technical help team on 01691 670394 or e-mail us your sizes and questions using our easy to use self survey form. Golden Oak finish door and close match RAL frame. 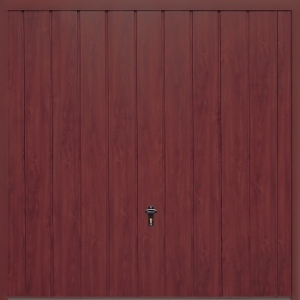 Rosewood finish door and close match RAL frame.